To encourage and inspire the love of dance by providing exceptional customer service, professional fitting expertise, and the very best dance shoes and fashion at an excellent value. Movin’ Easy began in 1981 as a very small New York style boutique combining street clothing and dance wear. Three grand opening events featured the first ever Austin gathering of dancers from avant-guard to ballet including a roller skate dancer, a sword dancer, and a Jazzercise exhibition. Movin’ Easy set out to make sure that Austin had a quality dance wear store that had the latest styles and the best expertise in fitting and ordering. Equally important was the desire to support local dance companies and schools to build Austin as a premier center for all kinds of dancing. Supporting dance companies and advertising their shows has always been a major part of Movin’ Easy’s public relations. 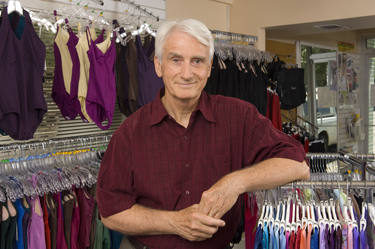 When Ballet Austin began their professional ballet company, Movin’ Easy established a streamlined and economical ordering system for all the company shoes, dancewear, and donated shoes to help build the apprentice program. From the beginning, training of Dancewear Specialists and Fitting Specialists became a top priority. Movin’ Easy’s first employee was a professional dancer on tour who needed a job to relocate to Austin. Her contributions laid the groundwork for Movin’ Easy’s customer friendly displays and an extensive training program for Dancewear Specialists. Today we continue to train all of our employees in sophisticated fitting techniques, guaranteeing that our clients will walk away with the right fit. Movin’ Easy was created by Tim Hurst in 1981 based on his love of dance and his desire to support the courage and determination of dancers of all ages and styles. Coming from a small town in West Texas, he did not grow up dancing but began at the age of 40. He can be found in the store on a regular basis or around town at the many studios he has relationships with — learning more about their needs so his store can support the dancers that will need to be outfitted in shoes and clothes.